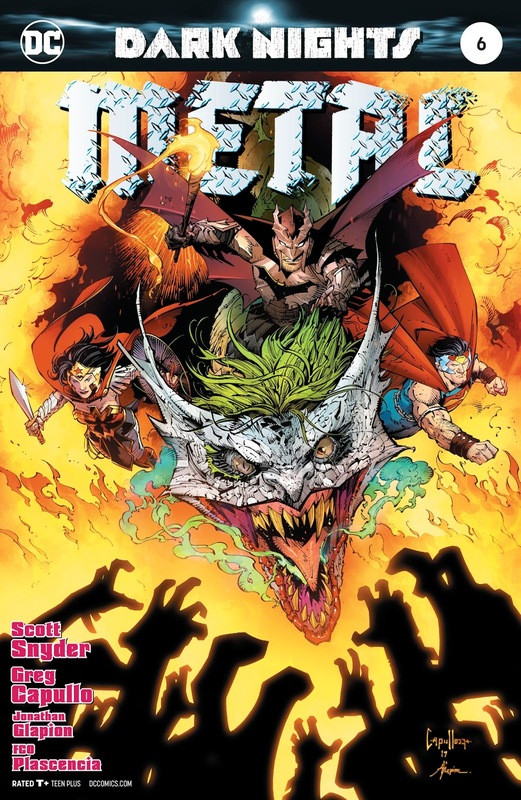 Today we do an explainer post for the ending of Dark Nights: Metal which finished this week; written by Scott Snyder with art by Greg Capullo. So let’s try to make this as concise as possible. Barbatos Plan: Pretty much he wants to kill the “light” part of the universe, because he’s pretty much the embodiment of all the dark things in the multiverse. 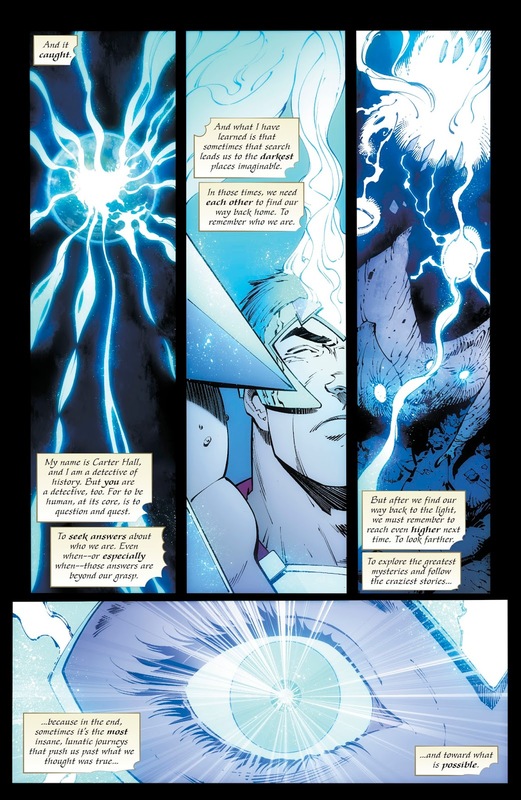 This is the reason why he has an army of “Dark Knights” and why he wants to pull down Earth Prime to the Dark Dimension. 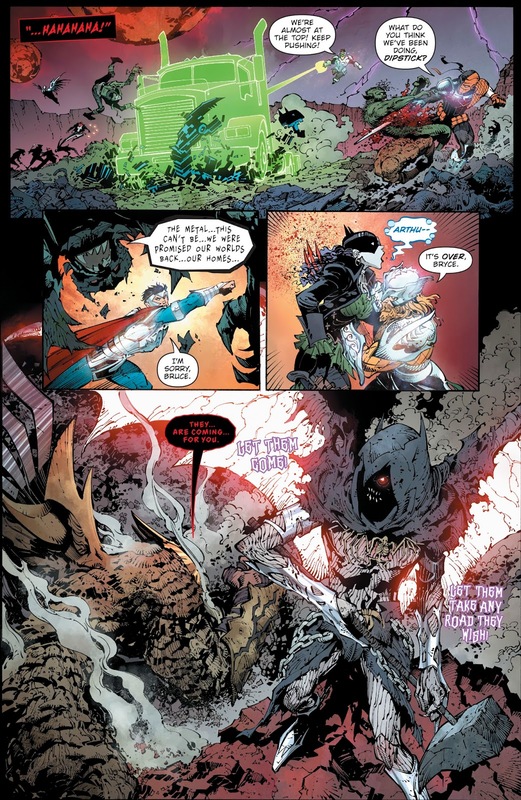 What’s Going on with the Heroes in Dark Nights: Metal # 6? The heroes end up in a very bad place when we start. Wonder Woman was lucky enough to switch the situation from bad to good even when Kendra turned into Lady Blackhawk. They make their way to Challenger’s Mountain to reach the antenna, which Barbatos has been using to channel dark energy into this dimension. As they scale Challenger’s Mountain, they revive the unconscious members of the league who had fallen last issue. Diana and Kendra make their way to the forge where a corrupted Carter Hall had become the new keeper of the forge. Diana creates a way for Kendra and Carter to connect and free the Hawks from their corruption. 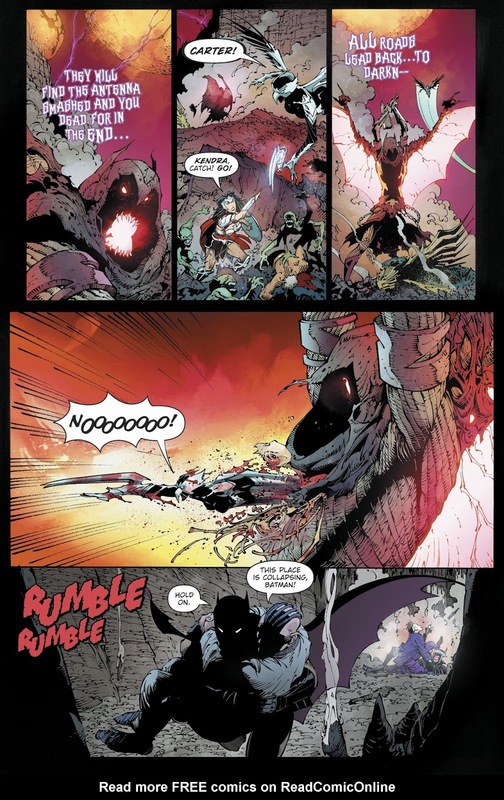 Superman and Batman return together with Flash, Raven and Cyborg aboard the Ultima Thule and with members of the 53rd Earth, which was revealed in Wild Hunt tie-in book. The League survives an attack from Barbatos, gets some 10th Metal armor action and Batman batarangs Aquaman and Hal Jordan wit 10th Metal to get sweet armor too. 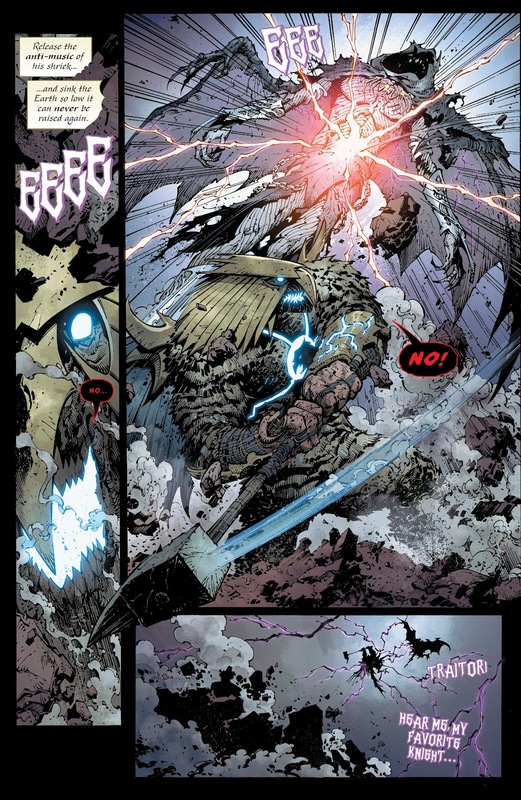 Hawkman and Barbatos has a “giant” fight but Barbatos wins, Hawkgirl aka Lady Blackhawk gets pissed, gets handed a 10th metal claw by Wonder Woman and flies through Barbatos, severely injuring him. Around hthe same time, Batman and the Joker team-up to take down The Batman Who Laughs and save the Overmonitor. Barbatos has been defeated as well as his army but the Earth is still slowly sinking into the dark universe. The Overmonitor helps the League get their minds in line as they try to use the power of the 10th Metal to save the world and get away from this hellish dimension. 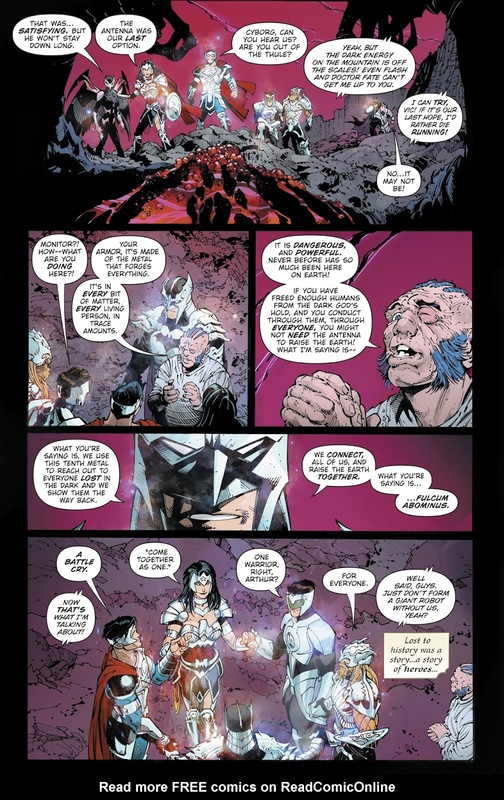 The main brunt for the ending of Dark Nights teases the next adventure for the Justice League and their allies (as well as enemies if we’re talking about Justice League: No Justice). 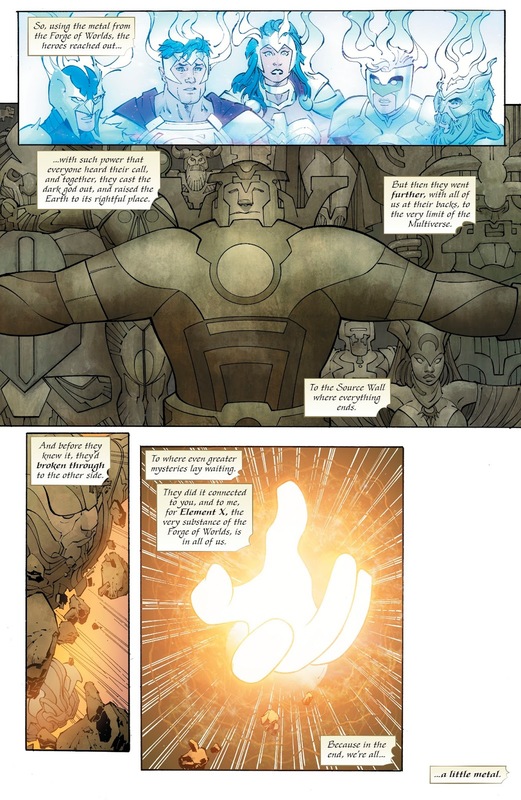 In a nutshell, they used the 10th metal to connect to every living being in the universe and have them help in raising Earth back into it’s proper place Using music, they touch everybody’s souls and they save the world before falling completely to the dark universe. 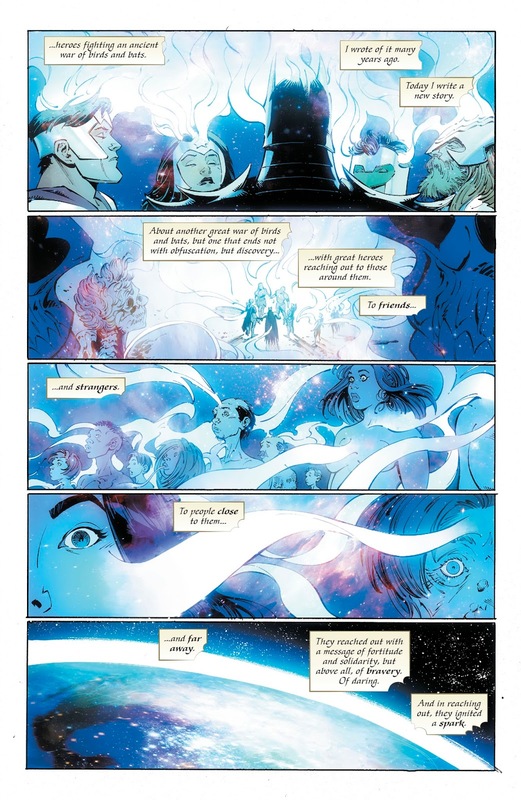 In the process, whether they know or not, the energy they had accumulated also smashed open the Source Wall, exposing the Universe to more trouble and wonder than ever before. Hope you fanboys and fangirls got all of that too.